Indeed what does interest car drivers? Probably a question they ask themselves a lot at Ford. Of course we need to ask which car drivers. The old sexist joke is that some women are more interested in the colour of the car than what’s under the bonnet. Unlike ‘real’ men – who drive a hunky Ford Wildtrak. They want power, drive, all the big features. Then, further down the list, comes colour surely… though I’m sure it would be a major “dissatisfier” to have the wrong colour. Maybe that’s the thinking behind this campaign. 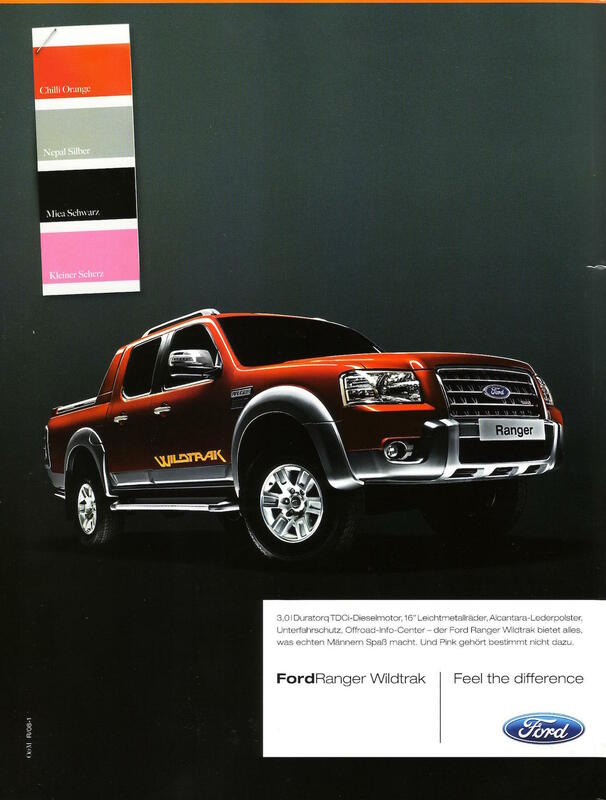 A major reason not to buy a Ford Wildtrak would be if it were pink! So in this ad they put pink in as an option. That will certainly raise an eyebrow or two. Just as well they’ve written on the pink colour strip “kleiner Scherz” (only joking). Nice. This entry was posted in Buying behaviour, Desire, Interest and tagged Ford. Bookmark the permalink.